Okay so here I have another Christmas gift that I made for my best friend, thought that I would share this with you today. I have had the idea to do an altered box for quite sometime now and after completing my first canvas piece, it totally revved me up to try a different medium. So when I learned that my friend had started sewing her daughter's dresses, I thought that this would be a fine time to try this....proving my support for all things crafty! And then of course it also had to have a theme - something pertaining to a seamstress....right? Keeping that thought in mind I tried to create ephemera pieces that completed my assemble and helped work the theme. 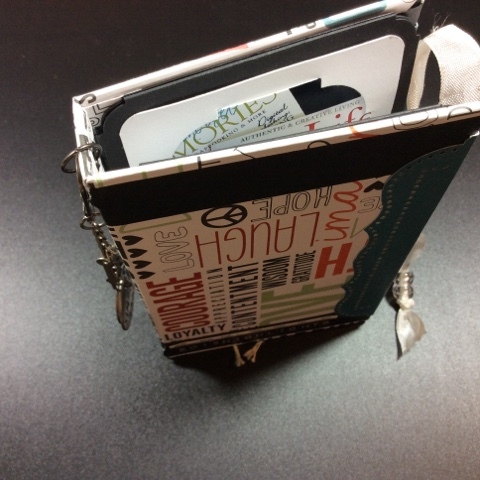 This one totally rocks - love my needle book - I'm such a clever crafter. Have been totally inspired by all the 'dress forms' within the market lately and all the vintage thread labels, it is all just so cool. I myself at one time use to sew, as in clothing, now I only sew for scrap booking purposes but I still love all the paraphernalia that comes with it and have been known to add 'notions' to an array of projects. For this particular project they couldn't have been more perfect - they suit it to a T.
Hopefully by peeking at my photos you noticed that I made all the main pages - pockets, and then added an additional slash pocket in the bottom right hand corner to tuck the journaling card in. This was something I came up with to give the mini more power to hold more photos & memories. The way I figure it is that the photos can go on the pull out tags then for those pictures that need a little more 'explaining'...you have the cards to jot down a few thoughts and then...well...after that what you have left is just something beautiful to look at filled with wonderful memories. Opposite of the slash pockets on three of the pages I did my own 'dresses' - as for the other three pages opposite of their slash pocket I added the 'Today' journaling spot - again one can never have to many jot spots..........humm............I like that 'jot spots'. Since having made these - I have been anxious to try even more ideas that I have seen all over You Tube. BTW- if I ever go MIA again you can bet I'm either buried alive in Pinterest or glued to You Tube. In fact I am hoping that here within the next few months I can launch my first video on You Tube, unfortunately right now I am video-editing impaired so if any of you have any suggestions or advice please send it my way I need all the help I can get. Alright well.....that's it.....hope you like my first attempt at altered art (technically my 2nd attempt) along with the mini that I created. More importantly I am thrilled that Tami likes it so well, she and her daughter both are excited to fill it up with photos of all the dresses she has made to date. Yay!!! Thanks everyone for sharing my passion with me, peek anytime day or night and feel free to comment, I'll gladly take any advice or suggestions you have.